1872 JAN 11 NORWEGIAN VESSEL, ASSISTED VESSEL. 1926 FEB 15 S.S. "URKIOLA-MENDI" OF BILBOA. ASSISTED. 1930 MAR 4 MOTOR BARGE "CAPABLE" OF LONDON. 1932 MAY 15 S.S. "ROUMELIAN" OF LONDON. The R.N.L.I. 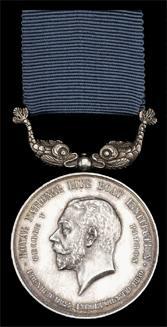 Medal in silver, was awarded 14 April 1916 to Benjamin Jacobs, Coxswain of the Brooke Lifeboat. 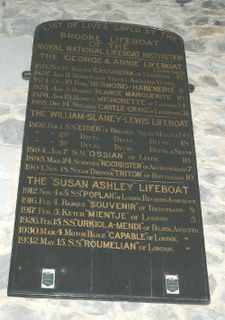 The citation reads : â€˜4 February 1916: In a south-westerly gale raging on the night of the 3rd, the Norwegian barque Souvenir of Trevisand was wrecked to the south-east of Brooke, Isle of Wight. She had already become derelict and unmanageable in the violent gale off St. Catherineâ€™s and drifted through the darkness, stranding hard and fast on the Great Stag Ledge in an area of comparitively shallow water studded with rocks. The recommendation for the award was made in February 1916 but only confirmed in April following an investigation into the events of the service. The medal was sold at auction in June 2005 for £1800.